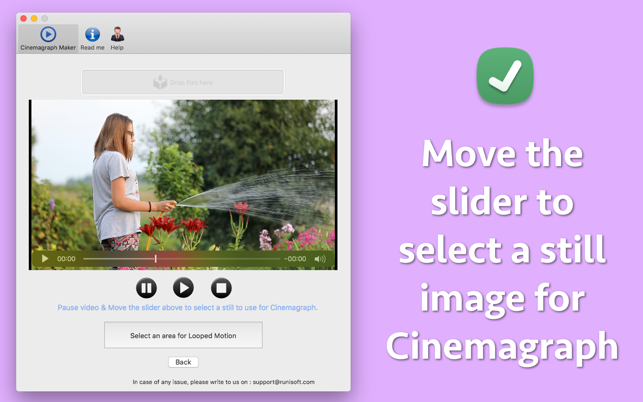 Convert a video to a Cinemagraph. In the Cinemagraph, only a small area of the video moves repeatedly but the remaining area remains fixed without any movement.This combination creates a stunning animation which looks great. The Cinemagraph could be created either in GIF or in a Video format. 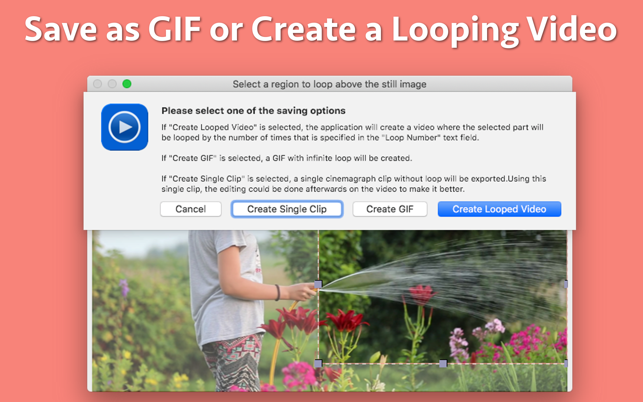 -- A GIF format Cinemagraph loops infinitely. -- Cinemagraphs that are created in Video format will loop by the specified number of times.For example : If 50 is specified, the Cinemagraph will loop by 50 times. 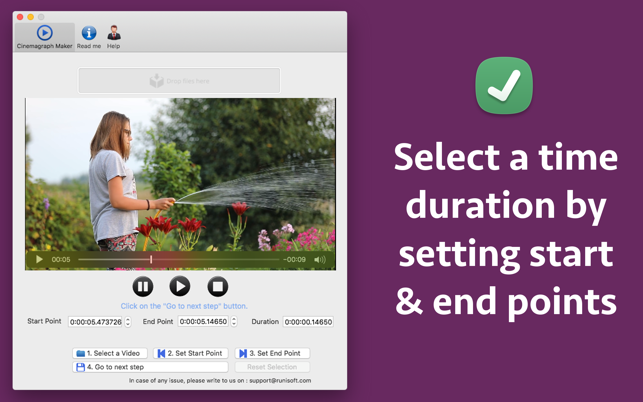 When a Cinemagraph is created in video format, it will have the video type similar to the source.For example : If the source video is in MP4 format, the created Cinemagraph video will also be in MP4 format.The application supports video formats of MP4, MOV and M4V. The GIF and the Video are created in High Quality.The quality of the created Cinemagraph is similar to the Original video. -- Make your content more appealing : The contents look more appealing and attractive. This attracts and engages more users towards your post. -- Tell stories using Cinemagraphs : Highlight specific moments and isolate these moments in a loop. 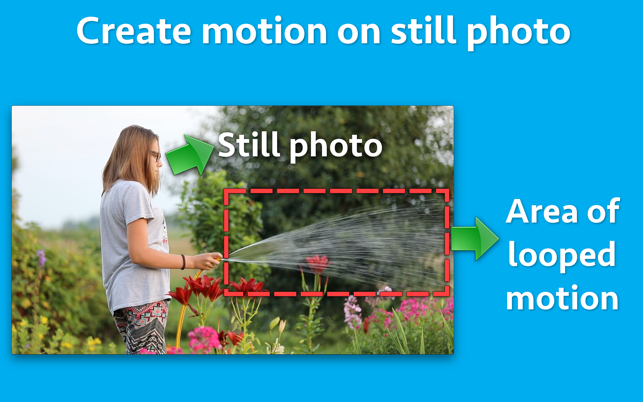 This could be great in storytelling & could be used to focus on specific product or experience.The specific nature of a Cinemagraph also will appeal to the users and help them to understand the fact that you want to convey to them. 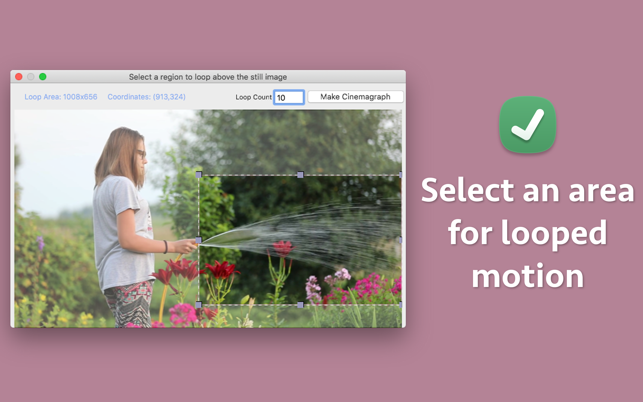 -- Grab attention : Grab attention by using the motion over still photos in Cinemagraphs. -- Focus on essentials : Focus exactly on the area in a video where you want your customer's attention.For example : If you want to show something specific to coffee mug in a video, just make that area in motion and keep the remaining area as a still photo.This will draw the attention of the customers towards the coffee mug because it is the only object in the entire area that in moving. - Fixed an issue where the progress messages were appearing faded out. - Fixed an issue where the application was freezing for a small time interval. - Fixed an issue where sometimes the cinemagraphs where getting rotated in wrong direction for Portrait videos. Created my first CINEMAGRAPH and was pretty simple and works real good. Thank You David for your complements !